Both Williams cars were in the points, but not where they wanted to be while Fernando Alonso and Jenson Button both saw the chequered flag. Felipe Massa: "It was a frustrating day for me. I struggled at the start and then the soft tyre in the first stint didn't operate as well as it should have done so I lost a few positions. At this point we were fighting from behind but the medium worked well. I couldn't overtake the Force India of Perez at the end as their straightline pace was good. It has been a difficult day but to still finish sixth is the main positive we will take away from the weekend." Valtteri Bottas: "We haven't got the result we were after today. The pitstop and the race pace are two areas that we need to investigate. We thought we would be stronger during the race but the soft tyre in the first stint didn't work as well and put us in a difficult position. We have to make sure we bounce back well in Monza." Marcus Ericsson: "First of all, I had a good start, managing to pass Daniil (Kyvat) with a good move into Turn 5. Quite early in the race we realised I had some debris stuck to the floor, which made us loose downforce in the first stint. We could not keep up with the competition, so we lost some ground, which was a bit frustrating. For the second stint we cleared the debris away and I was able to start to push more. Even with that, the pace was not as strong as we expected. We were a bit lucky in the end, and we were able to score one point. For me it is great to be back in the points for the second race in a row." Felipe Nasr: "It was a tough race for me. At the start I struggled with a lot of wheel spin, losing some positions. My race was compromised by braking issues. Besides that, I also got a slow puncture on the front left tyre during my last stint. There were many issues for me this time, but I am confident the upcoming race weekend in Monza will be better." 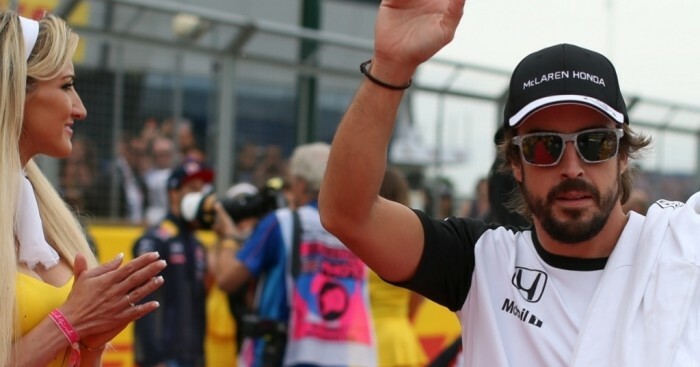 Fernando Alonso: "That was a tough race and a painful weekend: we simply weren’t competitive today. My only fun came at the start – to start 20th and be 14th at the end of the first lap was a good feeling. After that, our overall pace wasn’t good enough, but at least we got both cars to the finish, so hopefully we can learn a bit for the next race. That’s just the way things are at the moment. Monza will also be difficult, but I’m sure we’ll have some better races after that. Jenson Button: "From the early laps, I had a problem with the deployment from the ERS pack. I’d get deployment from it in different places now and again, but it was never really deploying and recovering as it should. It would cut immediately after Raidillon, for example, and then I’d have to rely on the ICE alone. That’s a lot of power to lose, and it meant I was driving the Kemmel Straight and the straight up to Blanchimont without any deployment at all. You can’t really do much in that situation." Roberto Merhi: "It was a good race for me. I got ahead of my team-mate on the first lap and things stayed that way until the finish. It was a bit of a lonely race for me to be honest, and mainly about managing my tyres so that I could push when I needed to. I think the strategy worked out well to limit the blue flags, and this enabled us to maintain reasonable pace. It’s always a real pleasure to drive here at Spa; you never get tired of experiencing Eau Rouge. And of course we start the second half of the season with another two-car finish, so a good solid weekend." Will Stevens: "My start was really good. I managed to get in front of Nasr in the first corner and then I came out and I was sandwiched in the middle of two cars, and with no room. I was hit and that compromised me quite a bit. I lost position and although the pace was really good, I wasn’t able to regain the place. So, a race that hasn’t really gone my way in terms of the result, but a positive weekend overall and of course we achieved another two-car finish as a team."